I arrived at St Austell train station around midday; looked around a nice record shop, Museum Vinyl, in the historic Market House, and, naturally, a few charity shops. Again, another Cornish town not exactly inspiring, with its best buildings boarded up and derelict, but with stunning countryside all around. Again, naturally, the beautiful countryside was devoid of people on a glorious Saturday afternoon whilst the ugly, homogeneous high street was heaving. Enthusiasm having waned slightly on the copper and tin mine front (and no doubt having bored friends and family by dragging them around to see them), I moved onto the China clay pits with ease, like a breath of fresh air. I arrived at the China Clay Trail about half a mile out of town, and walked along a flat cycling track for a while, passing old rusted remnants of the mining industry hidden in the trees and foliage. Some of it I explored. The track ran parallel to a road down below and what sounded like a river and waterfall, though I couldn't see them for the trees along the path (more of which later). Some time later I arrived at the Wheal Martyn Clay Works Museum for a coffee and Kit Kat break (I was in an extravagant mood, having not needed – by which I mean the ticket office was closed, the ticket machine was broken and no one on the train asked to see my ticket – to buy a train ticket, plus finding a fiver on the pavement). Like the Mineral Tramway Trails, the 37.5 mile network of paths exploring Cornwall's tin and copper mining heritage, the Clay Trails around St Austell are a series of walks traversing the China clay history of the area, taking in pits, dams, peaks, historic mines and lovely scenery and wildlife, with large parts of the area feeling like a martian landscape. The surreal and towering white-peaked clay tips, which are large hills made up from the mining waste, are known affectionately if ironically as the Cornish Alps. Some part of me, briefly, wanted to make a model of them out of Sainsbury's instant mashed potato, similar to Richard Dreyfuss doing the same with Devils Tower in Close Encounters of the Third Kind. Similarly surreal and incongruous, the dams and lakes in the discarded pits are a gorgeous, luminous turquoise colour, making them look as inviting as a beach in the Maldives – though they are full of chemicals left over from the China Clay mining. Combined with the lush vegetation which has sprouted up all around the pits (actually a lot of it purposely planted, a local horticulturalist told me), there's an otherworldly, almost Jurassic-era feel to the area. I started walking one of the clay trails proper, from the museum to the Eden Project. I didn't make it all the way to the Eden Project, partly because I was already shattered, but mostly because I found the two things I'd wanted to see about halfway along the four mile trail: Baal pit, and opposite, the Great Treverbyn Tip. 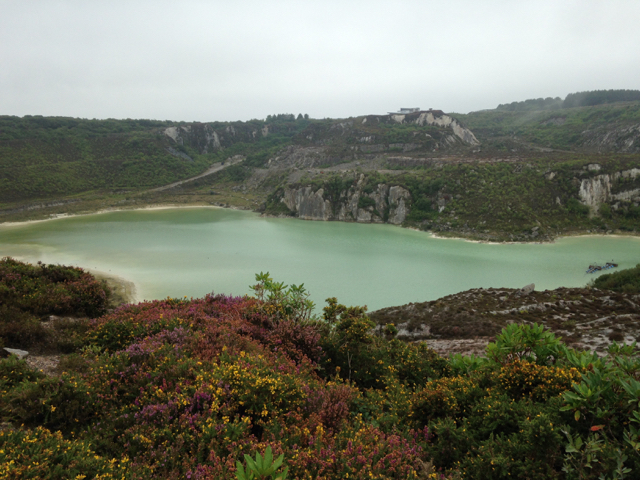 Baal pit (pictured above) is a massive disused China Clay pit, partially flooded with the turquoise lakes, and teeming with wildlife. It has a fence all around it, and I asked a local dog walker if it was okay to go through the fence. She was guarded at first, asking me why I was here, but after I told her I was just here to take photos and look around, she said it was okay to go over the fence. Then she told me about the proposed 'eco village' plans for the pit. I thought it sounded a good idea – I imagined a giant dome, Eden Project-style, covering the entire pit, the poisonous lakes transformed into safe swimming pools with beaches, and people living in pod-like eco homes with palm trees and mangoes growing in the tropical environment. Eh, anyway, it's just going to be a bunch of houses and offices. The lady was very opposed to the eco village, and said it would completely destroy the area, which had become a nature reserve, with plants, trees and many species of birds, some endangered, flourishing. I went through the fence and explored the pit. It was certainly a beautiful, peaceful area. I stood looking over one of the lakes, watching a flock of birds flying over it. An elderly couple had also climbed over the fence and came walking my way. We greeted each other, and I checked with them too if it was okay to be walking beyond the fence – it felt like I’d stumbled onto the set of Stalker – and they said it was okay, just to say i hadn’t seen them and they hadn’t seen me. They walked back towards the fence, only to reappear again five minutes later. I tried engaging them in conversation. The man had been a miner in this very pit. He'd worked there every day, seven days a week, for a decade, up to its closure in the early 1990s. I told them how beautiful and peaceful it was. Try to imagine it as working mine, with the pit completely white, the woman told me. Hard to imagine, I said. In the 1970s an episode of Dr Who exploited what would have been a far more alien landscape than what it is now. The couple were also opposed to the eco village. I knew why. I've been all for regeneration in recent posts (here, here and here) but that's been for abandoned buildings, not flourishing nature reserves. Mist was closing in. The couple went on their way, joking as they went, ‘I hope you know your way back’; ‘No!’ I replied in earnest; but they merely chuckled and went on their way (the opposite way they’d come). I took some more photos then attempted to follow their route back, which cut across the pit, avoiding having to walk all the way around it again. I followed them down a steep hill of rubble, not sure how they’d managed it, then slipped all the way down, cutting my hands on the stones and covering most of myself in white chalk. I got up, brushed myself down, then suddenly the place felt a bit eerie, and I wanted to leave. I heard strange noises. The plants all looked artificial. Mist was still closing in. The couple had completely vanished. From the pit I walked a more direct route back to town, along the road. I'd looked on my phone for anything else to see in St Austell, and found a lovely-looking waterfall in an area called Menacuddle Well, not far on the other side of town. Well, I got ridiculously lost in a run-down housing estate, even whilst using Google Maps, and wasted an hour or so. Then about a mile away from it, my phone went dead. Still, I recognised the area. I was walking along the road parallel to the cycling path I'd walked hours ago. Then I heard the waterfall again and walked off the road, down into the small woodland area completely shattered and bathed in sweat. But what a beautiful spot. Completely secluded and tranquil, it's an ancient sacred site, said to be haunted. The holy well itself is in a tiny 15th Century chapel (seen here), which abuts into a stone wall. There's also an ancient bridge and 'druid's chair', a seat carved out of stone. I was done. I hobbled back to the train station, got the train home. Collapsed. Pie and instant mashed potato was for dinner, for sure.